While temporarily living in Maryland during my husband's job training, we drove up to New Jersey to look for a place to live. As we drove through Delaware, we joked, "Who lives in Delaware? You never hear anyone say they would love to end up in Delaware." One year later, my husband got a job assignment for a couple of weeks to Wilmington, Delaware. We didn't want to be without him for so long, so I packed up the kids and headed to stay with him for a week. I figured while my husband worked, we could just explore. And I love exploring. I searched the internet for "things to do with kids in Delaware" and flipped through visitor's magazines. I was pleasantly surprised. There was a lot to do, so I mapped out our week and we dove right in. We just got back from our third trip to Delaware. In fact, we love whenever my husband get's that two week assignment. Even if we only go down for a few days, we always find something new to do. We really couldn't afford a vacation this year, so it was a pleasant surprise when he got the trip again. We actually got to go somewhere and do some neat stuff, and we didn't have to pay for a hotel! Sweet! Delaware is full of history (which, sadly, is something I never appreciated until now). It was the first state of the union, for crying out loud, so there are a gajillion places to visit that make you appreciate our nation's history. The DuPont family began there and their amazing estates will make you ooh and aah. If you are a history buff, this is your heaven. It's breathtakingly beautiful. Marshes, rolling hills, manicured gardens, winding creeks, and rivers make for amazing landscapes that urge you to just keep driving and driving. And you can't help but imagine our country's first battles that occurred on the very land you are discovering. Here's some pics of our trip to Dela-Where, I mean, Delaware. Click the links below to check out more. 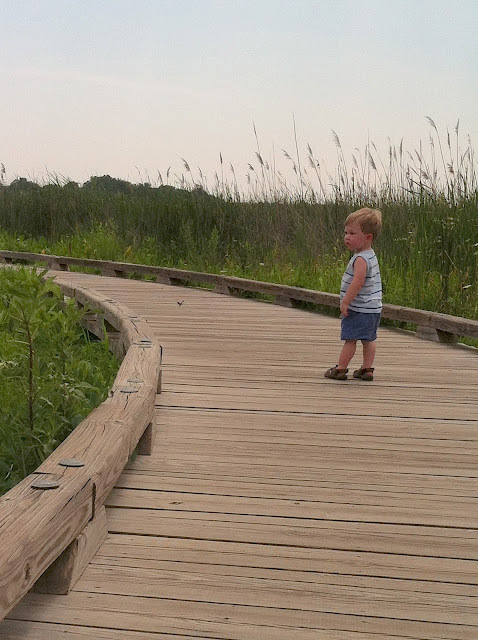 Peanut, walking the boardwalk in the marsh at the DuPont Environmental Education Center. The Smith Indoor/Outdoor Playground (yes, it's a mansion just for playing) in Philadelphia. 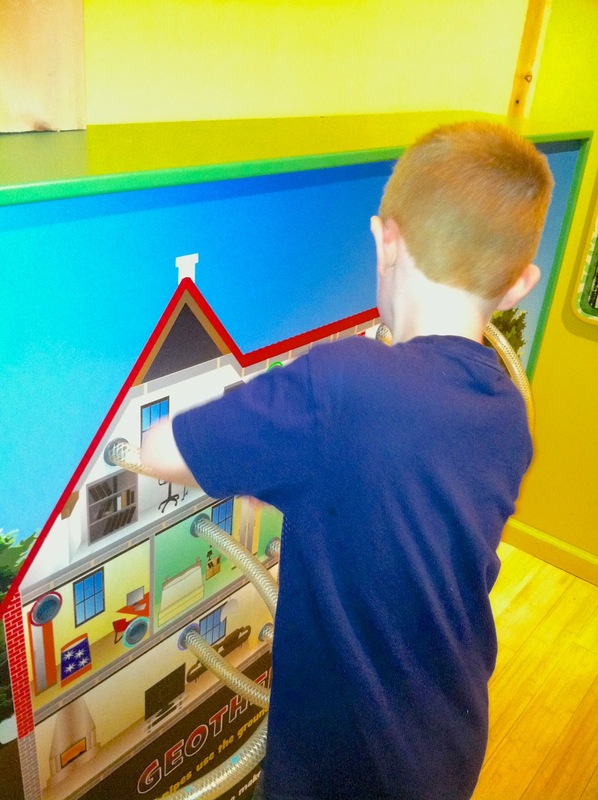 Opie, figuring out air-flow at the Delaware Children's Museum. 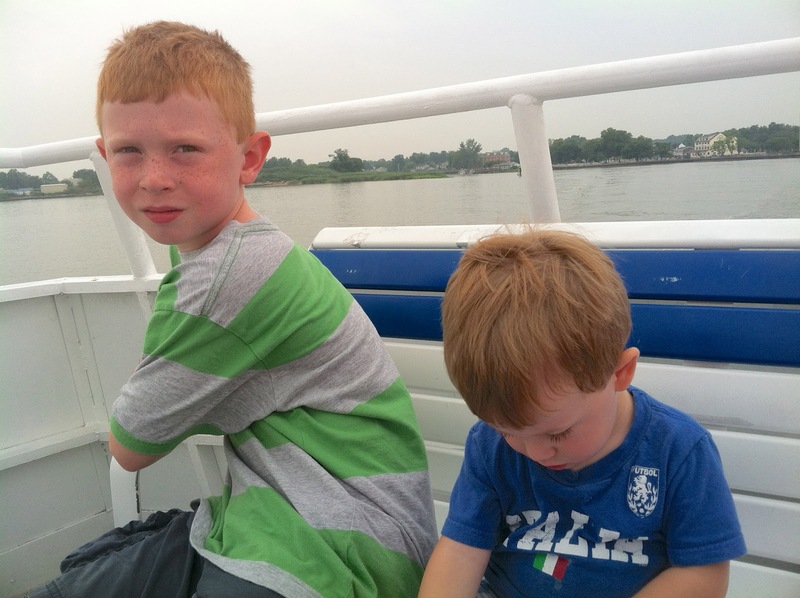 On a ferry ride to Fort Delaware. Outside the American Helicopter Museum in West Chester, Pennsylvania. Mmmm i adore philly. And i really have never been to delaware... Except for driving thru it. Looks amazing. What were the colonial flavors of ice cream, and what on that sign behind you says motor oil, is that a flavor? My aunt and uncle live in Delaware, so we've been there too many times to count! It is a beautiful state with so much to do, but you'd never think it. Have you made it to Rehoboth Beach yet? I had so much fun there as a kid. Glad you guys had a great time! We thought about going down that way for a day, but without Lance, I wasn't up for a beach trip toting two kiddos.. HA! We will go, though. Great pics and you have a stinkin' cute family! Looking forward to seeing more. And, I LOVE Philly too. Such an amazing city! Thanks! I definitely try to keep in tow with my hubs. My boys love their Daddy, too. You know how that goes. And I wish I would have noticed the Motor Oil flavor on the sign while I was there. I would have had to ask!